Another fine Kelty product. Again, this was my first tent after my new-found interest. Kelty has another fine product that did not break the bank. My very first night out with this tent it rained all night long. I laid inside the tent with my son, the whole time waiting to feel a drop of rain, but I never did. The tent worked great, and it hasn’t let me down any of the other many times that I have used it. 1. Weight. 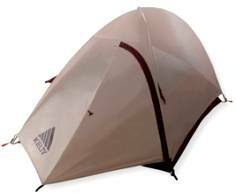 This tent is a little on the heavy side when compared to some of the other lighter-weight tents available, However, these lighter options are much more expensive. 2. Size. While size cannot be held against the tent since it was listed when I bought it, it is something that I have learned to look into more when considering a tent. A good thing I have learned to do is to use some tape and tape out the dimensions on the floor and then try it out. 3. Entry. This tent features a front entry. While this is not to bad, side entry doors would make getting in and out much easier. Take into consideration though, if the tent will be shared, a door on each side is recommended here to keep someone from crawling over you to get out. 4. Vestibule. This vestibule is small, but my wife and I have fit both out packs and our shoes under it while camping on the AT last September. Typically vestibules are slightly larger on tents with side doors. While I have come to learn about these things while using this tent, I cannot complain about any of them. Like I said, this tent has been great, for what it is. Would definitely recommend (if you are 5’10” or less). You can read my full review here. It looks like you’ve come a long way from the time when you were using this tent for backpacking, but I wanted to ask your current opinion of it. The tent is pretty stinking light for a double walled shelter under $200, and I was thinking that it’s actually a very lightweight option for two people to split. How do you think this could work for two people trying to go light on a budget? Are there any better options out there that provide similar protection from bugs and the elements at the same or less weight? I don’t think I would go as far as calling it “stinking light” but it really isn’t too bad if you split the pieces up between 2 people. But, as for the tent itself, I do like it. I still have it, and have no plan to get rid of it. It is usually a loaner tent, or for my kids to camp in the yard, and I have also carried it with me to set up when I get to the trail head late at night to keep from unpacking my pack. It has adequate space for 2, but best if those people are average to small size. 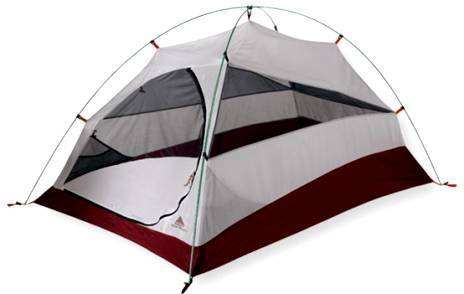 Me and my wife, or my kids and it is fine, but I may be a bit awkward sharing it with a grown friend… But the best thing is these can be found for around $100, so that makes it pretty affordable, and a decent tent.